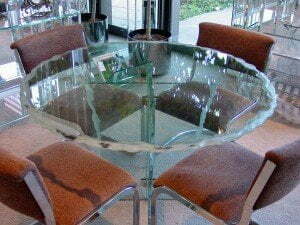 GlassWorks offers fully customized Heavy Glass Tabletops designed to rest on a table base with no other support. We recommend 3/8” and ½” thicknesses for these tables. As with all our products, GlassWorks’ tabletops are fully customized. So, no matter the size or shape, we can create the perfect Glass Tabletop for you. We can further customize your Tabletop with a wide range of glass types and edges. No need to leave your home or office – Call (847) 729-5580 today or submit a Quote Request for a free estimate and we can have your order in production tonight!